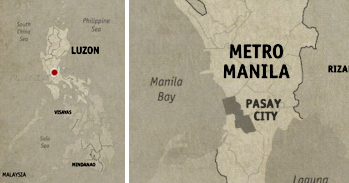 METRO MANILA | Martabak Café, Mee Goreng at Last! You cannot believe how unbelievably happy we were when we finally found a restaurant serving mee goreng in Metro Manila. It has been more than a year since we first had a taste of the said noodle dish in Jalan Alor, a street food mecca in Kuala Lumpur. And we were instantly hooked. We tried various substitute, even finding instant mee goreng noodles in groceries, but it simply wasn’t like the ones we tried at KL. And so it was that one happy weekend, we finally found a restaurant at the Mall of Asia serving our favorite Malaysian noodles, Martabak Café. Named after a popular Indonesian street food, martabak is a pancake stuffed with eggs and meat. 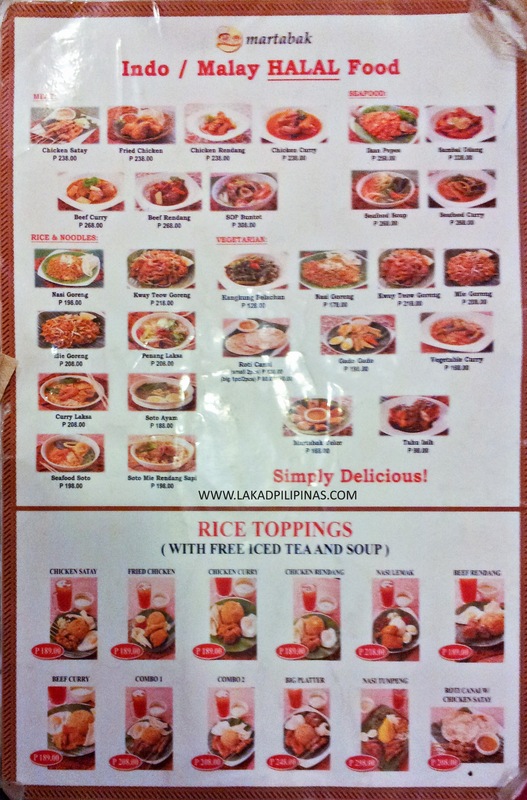 Unfortunately, we were too excited to find that they have mee goreng on their menu that we totally forgot to try that. 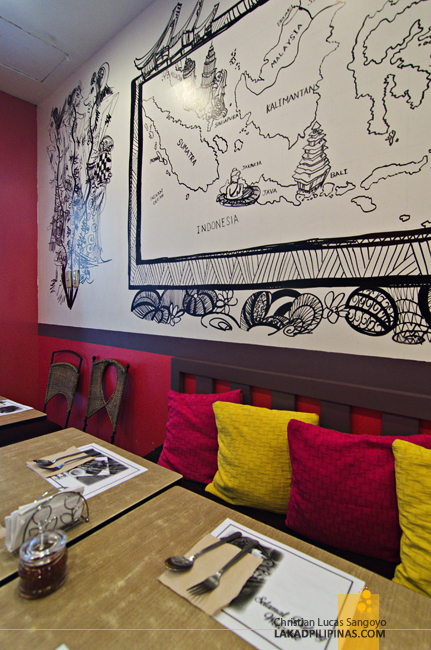 The interior of the restaurant is quite simple, red and white walls decorated with Indo Malay-inspired sketches with a few textiles hanging here and there from the region. You’d notice how legit the place is, not by its décor though, but through the number of Muslims frequenting the place. 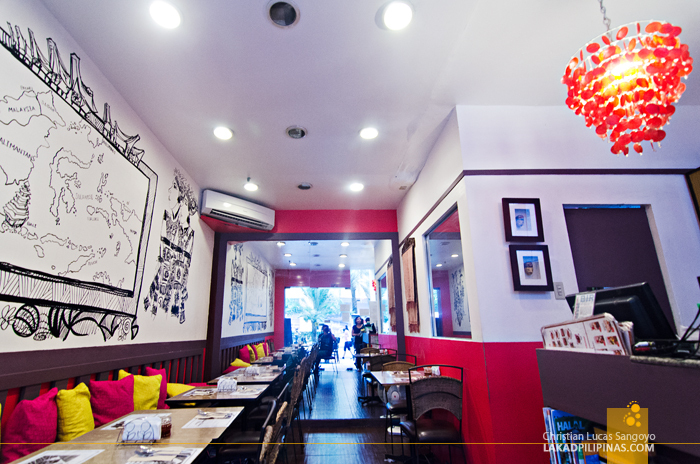 Martabak Café is a certified Halal restaurant. 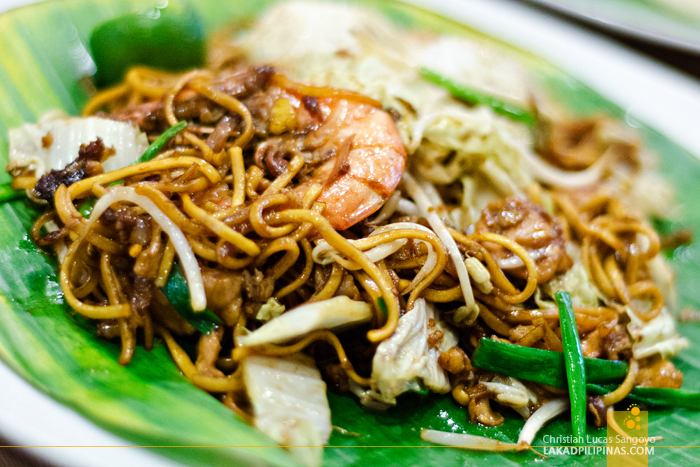 So what exactly is mee goreng (also spelled mie goreng and mi goreng), and why do we go gaga over it? Mee goreng is a stir fried noodle dish popular in Indonesia and Malaysia. 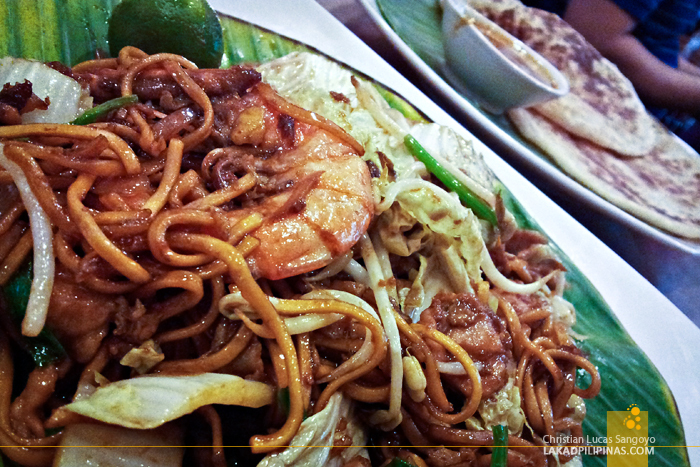 It consist of fried yellow noodles mixed with veggies, garlic, onions, shallots, chicken, beef and prawns. Most of the ones we tried at Malaysia were super spicy, even if we ask them to tone it down a bit. It has so many flavors going on all at once that it’s hard to find a direct replacement for it back here in the Philippines. After some minutes of impatiently waiting, our orders finally arrived. 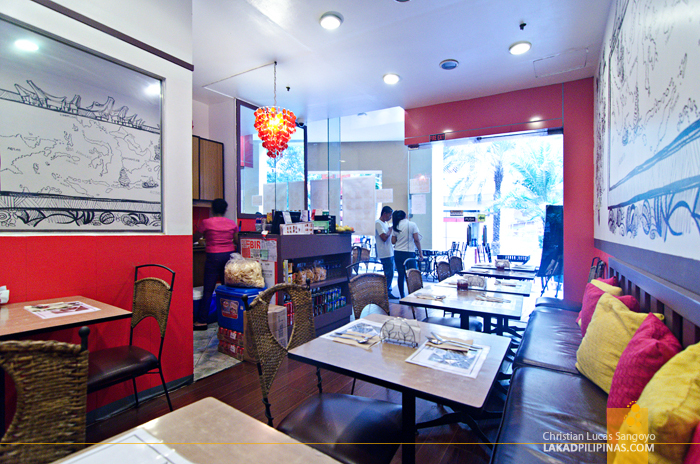 We asked for a plate of their roti canai (Php130.00), a bowl of curry laksa (Php208.00), a serving of mee goreng (Php208.00) and a glass of kopi ice (99.00). We were told that serving sizes were good enough for sharing, but we found it a tad too little, considering they’re not that cheap. 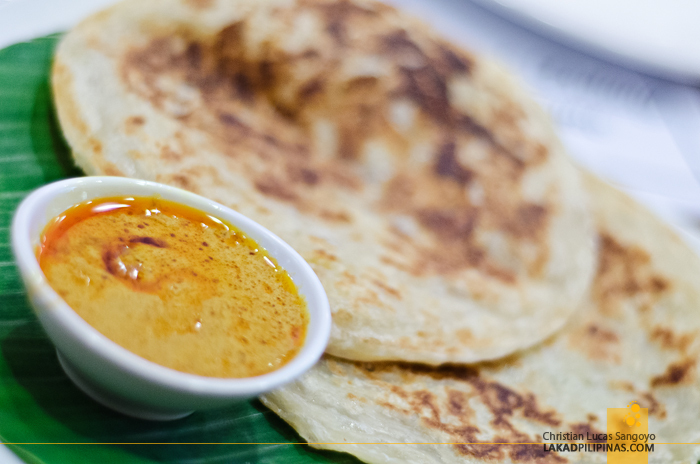 My buddy, who’s a big fan of roti canai gave a thumb up upon first dip and bite. It’s actually like the real thing, she said in between mouthfuls. 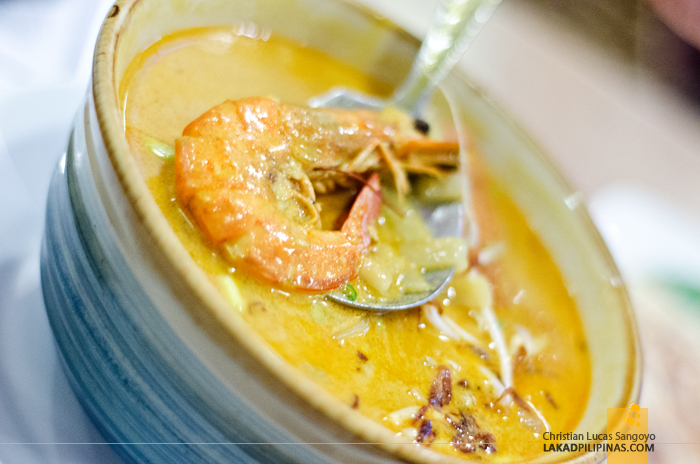 The curry laksa was also spot on, but very, very spicy! It was quite good that we actually didn’t mind drinking water after every sip. And at last, the mee goreng paired with kopi ice. From its looks alone, I can tell that it would taste like the ones we had in Kuala Lumpur. And I wasn’t that far in my assumption. 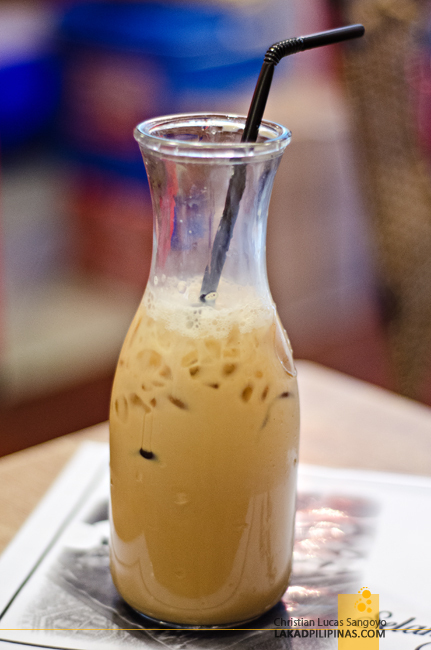 It was actually quite good, even better when paired with the iced coffee. It’s definitely something I can go back to every day if not for its prohibitive price (well, at least for me). Well, I guess it’s a good thing that Martabak Café is quite a ways away from home; else I’d probably be spending Php208.00 everyday just for snacks.